Michael Beutler’s expansive sculptures are usually created directly on site in relation to the given architectonic arrangements. In an experimental process that concentrates more on the logical sequence of mutually conditional decisions than on preconceived planning, Beutler develops structures and forms from conventional building materials—such as wood, plaster or glass—that question standardization. 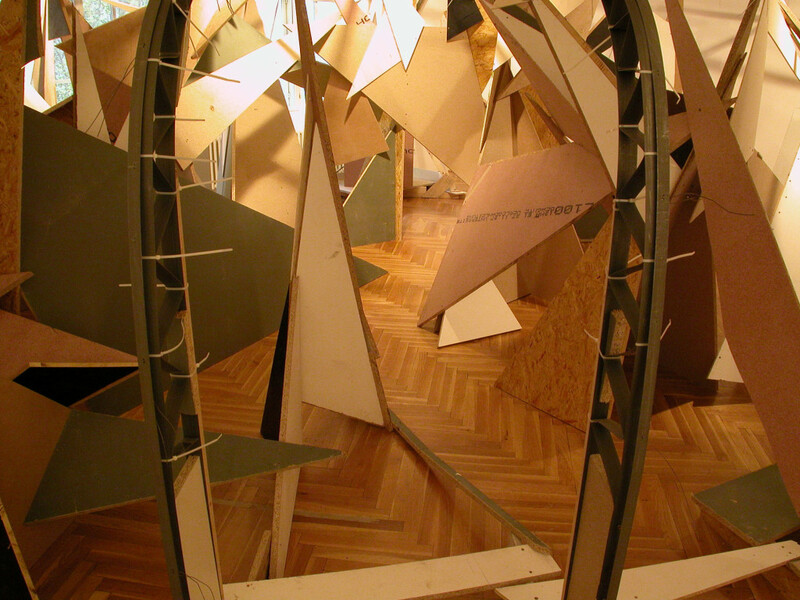 His methods range from do-it-yourself strategies, the compilation of (playful) rules for action, to the fabrication of machines that contribute to deformations. His work recurrently centers around an interest in conceptualizing the properties of various fabrication processes and material structures so that a content-based understanding of the materials and interventions takes precedence over a material-functional understanding. In his project for the Secession, Michael Beutler starts from the placement of the Grafisches Kabinett within the Secession and the characteristics of this space. The elements that are central to this are the way to the Grafisches Kabinett—the narrow stairs leading up to it—and its architectonic format: an almost square, very low room with an elongated, narrow window that has no thematic correspondence. 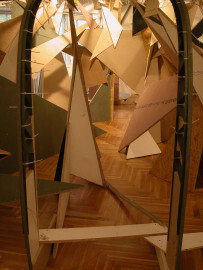 Michael Beutler relates these observations in combination with the otherwise very delicate and transparent ceiling construction of the Secession to the tradition of the glass pavilion in the second half of the 19th century, which was intended to create transparent interior landscapes on the one hand, but also standardized exhibition architectures on the other. Michael Beutler’s interest is concentrated primarily on one of the high points of this kind of construction: the Kibble Palace (Crystal Palace) in the Botanical Garden in Glasgow. It was constructed in 1872 by the engineer and architect John Kibble, and Michael Beutler visited it several times during his stay in Glasgow. The Kibble Palace has not only gone down in history as a masterpiece of glass and iron construction, but also still stands for a radicalization of standardization in industrial building production today. These considerations were among the impulses that led Michael Beutler to explore the methods of glass construction, resulting in the decision to make a glass, dome-shaped structure on site in the Grafisches Kabinett. 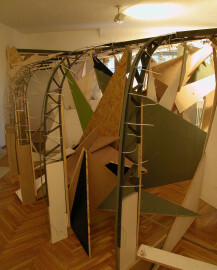 As in earlier works, the experimental construction process follows his interest in questioning processes of standardization, e.g. 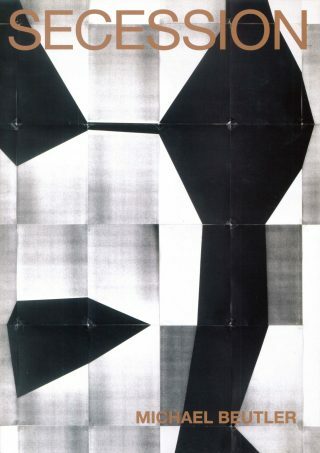 in glass and glass house production, as well as integrating new forms and methodological coincidences. Consequently, a pleasure in ornamentation is always also present in the sculptural spatial intervention at the same time. The glass sculpture is conceived as a work that encompasses the space, so that visitors are not confronted with a model-like perspective, but rather find themselves part of the spatial arrangement. The experience of different ways of building recalls historical attempts of alternative and utopian architecture and thus of forms of living, which the details turn into thematic components. 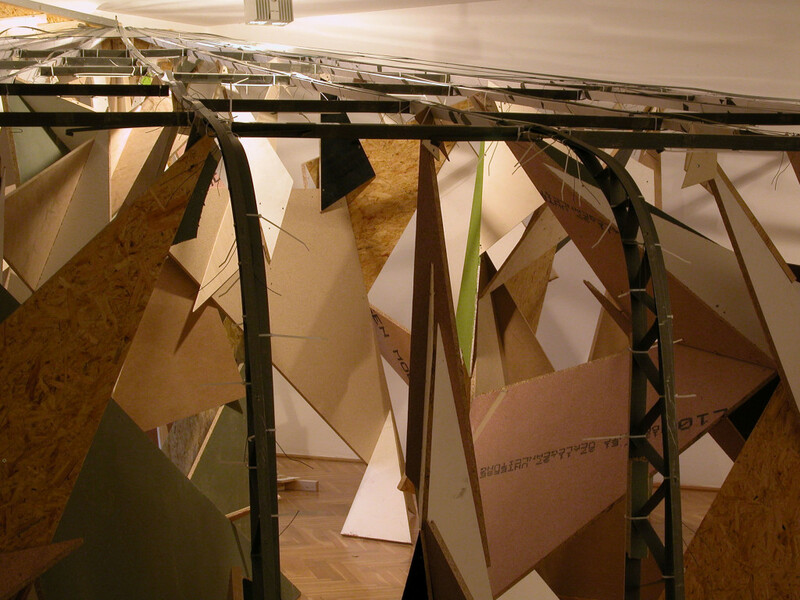 In recent years, Michael Beutler’s works have been included in, among others, the exhibition New Heimat at the Kunstverein Frankfurt, where he built a “zig-zag bridge” made of European standardized pallets. It was modeled on Chinese bridges between the mainland and temple islands, which were supposed to prevent evil spirits from entering the sacred places. 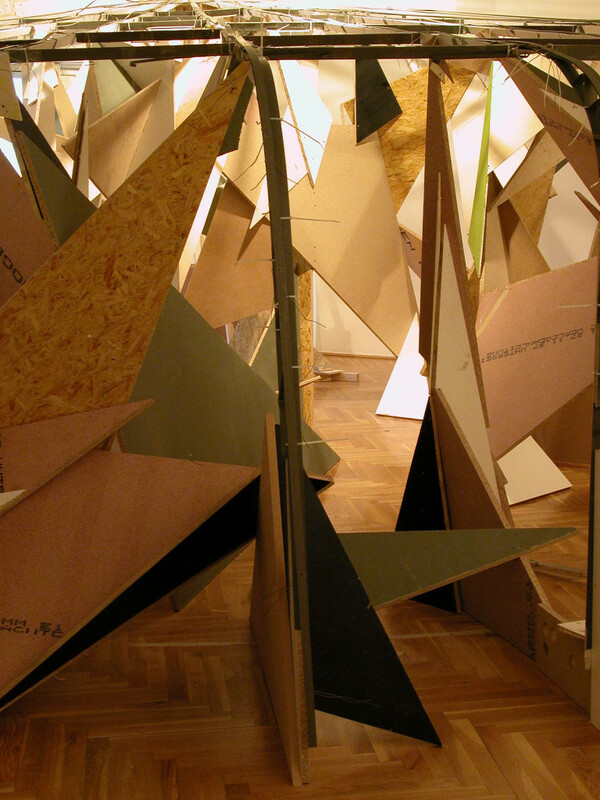 In September this year, he developed a project for the offspace kjubh in Cologne in collaboration with Henning Bohl. 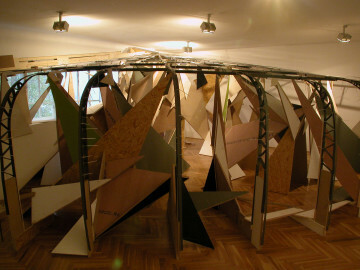 Under the title Florenz, he deconstructed a conventional party tent by “bending” the four round, metal side poles into an ornamental surface, so that the statics of the tent changed, leading to further interventions, all the way to cutting the roof into a plane like a canopy of leaves. 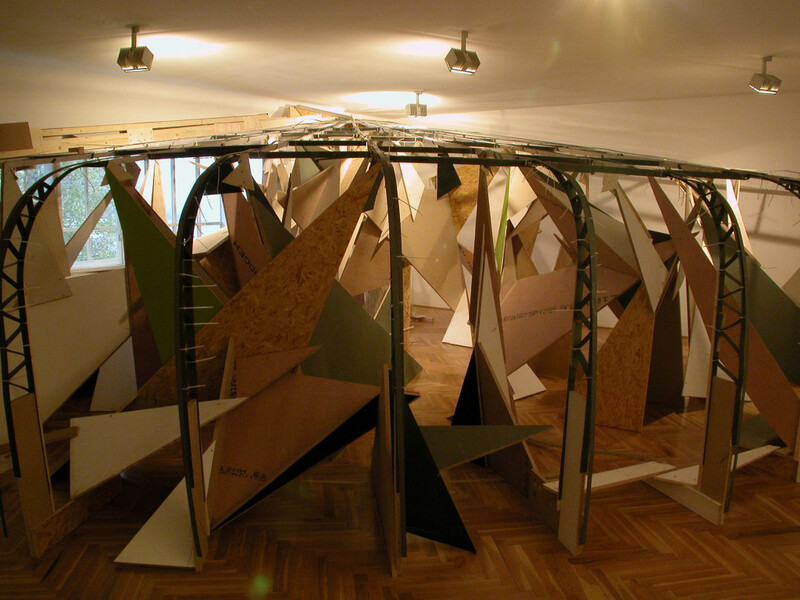 Michael Beutler, born in Oldenburg in 1976, lives and works in Frankfurt.